Thane, a metropolitan city in India, is an immediate neighbour of Mumbai and is one of the most populous urban agglomerations in the world. Home to various educational institute and businesses, Thane has seen a rapid development in the recent times. It has well-connected areas and boasts modern planning. With unmatched facilities and amenities, it has become a preferred choice for hosting grand wedding events. To simplify your arrangements post the selection of marriage dates, we bring to you a list of some of the best wedding venues in Thane West. Ceremony Banquet Hall, Thane, Mumbai is situated in the heart of the city and is easily accessible via road and rail. 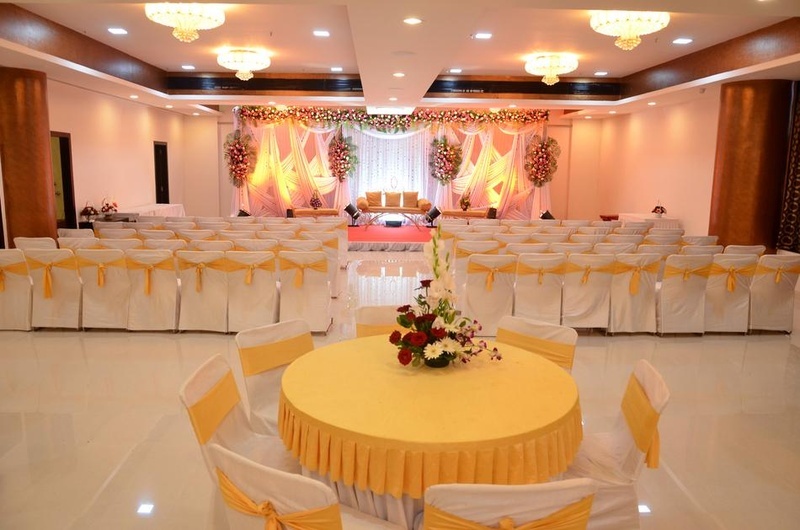 This hall in Thane, Kapurbawdi offers convenience and aesthetic value of the banquet halls, making it a popular choice among locals for hosting several social events such as weddings, receptions, pre-wedding functions, cocktail parties, anniversaries and so on. With all these facilities and a hospitable team on board, Ceremony Banquet Hall, Thane, Mumbai, surely tops in the list of the marriage halls in Thane and promises to be a great choice of wedding venue. Ceremony Hall Thane has in-house caterers who serve delicious food to guests. Ceremony Banquet Thane offers an expert team of decorators who take care of decoration. The venue offers ample car parking space to their guests and allows overnight wedding. There are complimentary changing rooms for the bride and the groom on their special day. It has multiple party areas which allow you to have different functions at the same venue. Valentine Garden, Thane West, Mumbai is a splendid destination for hosting your wedding and reception ceremony. It is located at a close distance from Ghodbunder Road which makes it convenient for all. Valentine Hall serves mouthwatering multi-cuisine delicacies to choose from in both vegetarian and non-vegetarian food to their guests. The lush green garden is perfect for nature lovers for a wedding that is unique and can house a large gathering. Valentine Garden Ovala Naka has a sprawling lawn that can accommodate a large gathering for events under the starlit sky. The management at Valentine Garden, Thane West, Mumbai offers comfortable services to all. With spectacular design and modern technology, the venue makes your event a magical occasion. Monalisa Lawn, Thane, Mumbai is just the right venue for hosting a grand wedding that will be the most talked about. It has a stunning lush green lawn that is perfect for those gorgeous outdoor weddings and receptions. Monalisa Lawns is one of the best wedding venues and is known for its unmatched service and hospitality. The experienced caterers make sure that your guests are treated with the best of delicacies. Monalisa Garden provides decorations as well to add extra vibrancy to all your wedding events. Monalisa Lawn, Thane is capacious and apt for an open-air function under the starlit sky. It is located near the D - Mart, Thane, Maharashtra, India also offers changing rooms for you to always stay camera ready. Treat your guests with a royal feast of multi-cuisine delicacies to choose from in both vegetarian and non-vegetarian food here at Monalisa Mumbai. Perfect for a cocktail evening, Mona Lisa Banuet hall allows alcohol to make your parties even more happening. Vishnuji Ki Rasoi - Silver Lawns, Thane, Mumbai is a great venue for organizing weddings, pre-wedding ceremonies and receptions. The venue has sprawling lawns for accommodating your guests. The staff at Vishnuji Ki Rasoi - Silver Lawns are also co-operative and take care of everything - from decor to food - to help you enjoy your day to the fullest. When you host your event at these wedding lawns, their services and amenities will make it a memorable one. Vishnu Ki Rasoi, Thane has ample parking space for your guests that adds to the list of conveniences. Vishnu Ji Ki Rasoi Thane has arrangements for in-house catering team and decorating team to help you with hassle free arrangements. At Vishnu Greens, you are sure to celebrate your love and togetherness and take home an experience that will be remembered forever. Treat your guests with an unforgettable event at the pleasing atmosphere of Silver Lawn Thane and host a party that becomes the talk of the town. You are sure to get the perfect planning and execution as the in house team of decorators and caterers at Silvers Lawn Thane make sure that you guests are treated well. RG Banquet, Thane West, Mumbai is a great venue to host your wedding and reception ceremony. The venue serves mouthwatering multi-cuisine delicacies to choose from in both vegetarian and non-vegetarian food. The decor team at R G Banquet Hall Thane takes care of the decoration for your big day. RG Banquet Hall serves alcohol and also allows you to get it from outside to make the menu look a lavish spread. It offers complimentary changing rooms for the bride and the groom on their special day. It has two-time slots, you can choose the one which suits you the best. RG Banquet, Thane West, Mumbai offers ample car parking space to your guests for their convenience.